Restricted to 3 item(s) only. 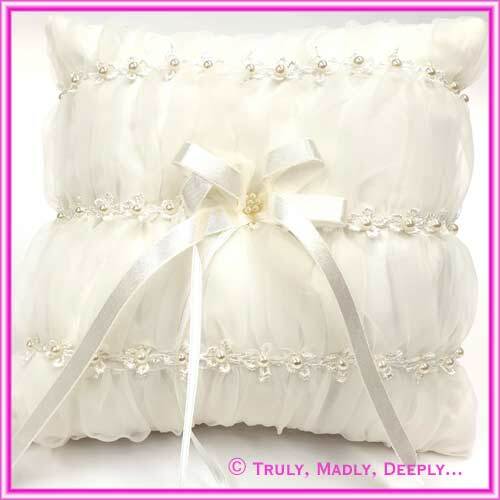 These beautiful ring cushions are nicely crafted with a ivory satin cushion covered in a gathered sheer organza and decorated with delicate lace flowers and pearl. They are finished with a pearl in each flower and a cluster of pearls in the middle. There is a 10mm ribbon to create the bow and 3mm ribbon to tie your beautful wedding rings onto the pillow. Ring pillow measures approx. 18.5x18.5cm.